My daughter gnawed on her honeyed toast, dropping bits into the top of the ant farm. The workers scurried to gather the crumbs. I sipped my coffee slowly, to avoid the cup's bottom, to prolong the moment when I left for work. Sarah and I watched the insects crawl through tunnels and burrows, hauling beige globs bigger than themselves to the queen. The sun warmed the kitchen. A sort of hypnotic peace settled over us. A bargain, my husband had declared, holding the farm in his arms. He smiled, sweaty from a summer morning spent yard-saling. Sarah will learn about community, he had said. She'll learn about hard work. What about you? I had thought. But I let him assemble the structure after he promised to release the insects when Sarah entered kindergarten. 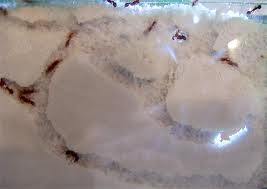 A year later and the ants still thrived, unlike the goldfish that went belly-up when Sarah sprinkled in too much Tetra. The farm occupied an entire counter. Somehow the ants escaped and found their way into the sugar bowl and the plastic-sheathed bread. Every time I squished an ant with my finger, I felt a piece of me loosen and chisel off. My husband bounded down the stairs, his happy noisiness preceding him. Sarah ran to him and they hugged, chattering, behind me. Pressure welled from my gut to my chest. The room clouded. Outside daffodils poked through snow and the air shimmered blue. I drained my cup, picked up my keys, the morning unbearable. Sometimes drama comes from the smallest spaces. This inspired some time ago by a 52/250 theme: crowded. I fell inlove with this piece almost immediately. So picturesque. The delight turns dark so perfectly. Just enough backstory to justify the turn, a flawless tack. Great job giving life to this scene. Wonderful word choices, phrases. I like this very much. Original, too.